System used to carry out multi roller tracks medium-heavy weight pallets or container handling conveyors. It’s the simple and ideal system to carry out multi roller tracks conveyors for medium-heavy weight pallets or containers handling. It is obtained by combining rollers series 129 and GL 50Z with the profile PR U50. 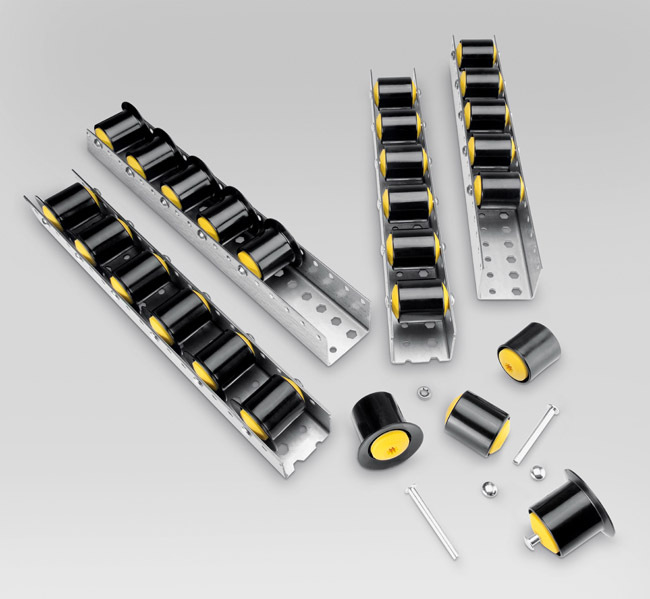 The 129 rollers are made of rugged and compact Polyamide black casing and yellow RAL 1023, or in the alternative colour on request, Polypropilene end-caps with precision ball bearings 6002. The GL are zinc-plated rollers with bearings without cage. Separately, zinc-plated steel pins, complete with bosses (starlock), are supplied for fixing into the profile. U profile is obtained with Z hot zinc-plated iron sheet (sendzimir) and presents a multiple drilling at 26 mm. pitch also on the base. It is particularly strong, as it results from the diagram herebelow. The supply foresees loose components following the ordering codes. The profile has a length of 6200 mm and must be faced to obtain the first hole, 13 mm. distant from the end.